I know I haven’t updated in nearly a month; please forgive me! 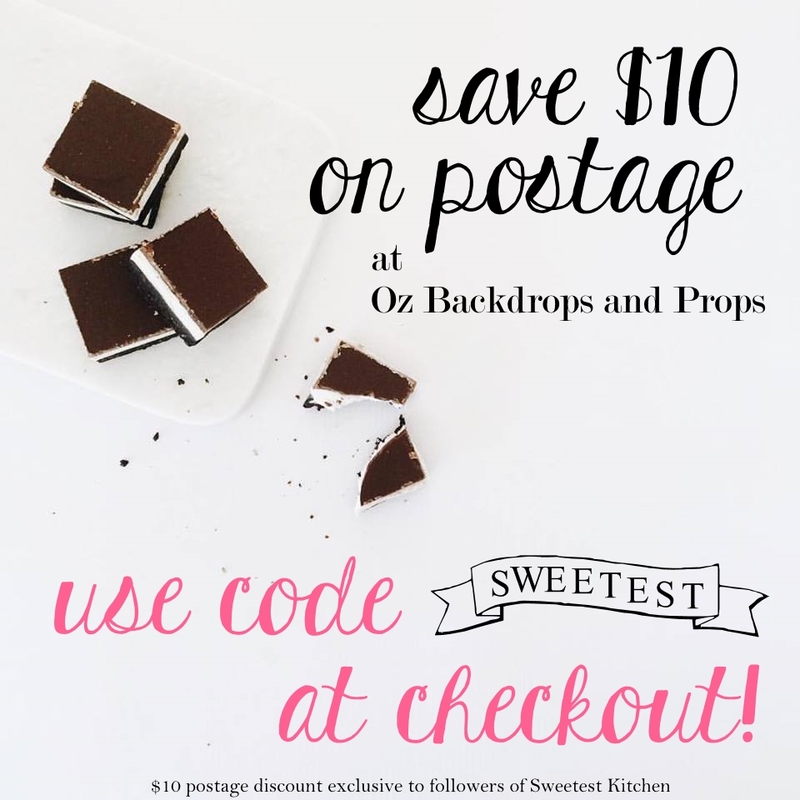 If you’ve been following along on Instagram, you’ll know I haven’t stopped baking and cooking. I just haven’t had time to take photos on anything other than my phone, let alone transfer those photos to the computer, edit and watermark them, and write an entire post about the whole thing! That, coupled with a lack of inspiration for styling and writing, has put me off blogging in the last month. However, I am trying to make a comeback, and what a comeback post this will be! 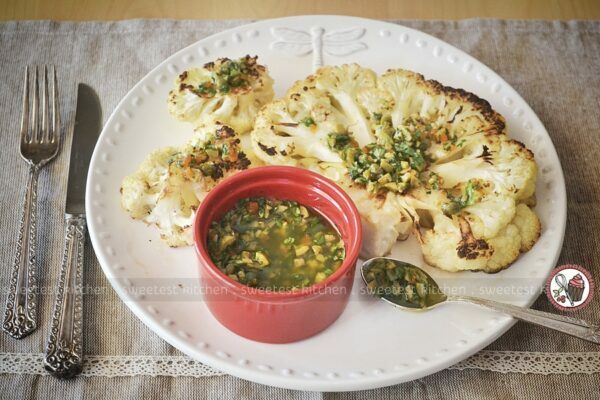 Cauliflower steaks! 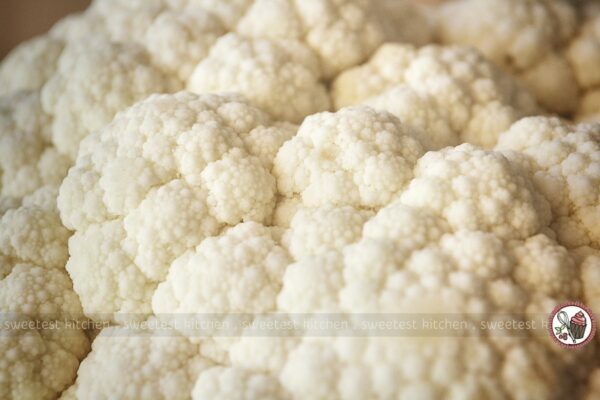 You’re scratching your heads, trying to work out what a cauliflower steak is, right? Well, first of all, there’s no meat involved. 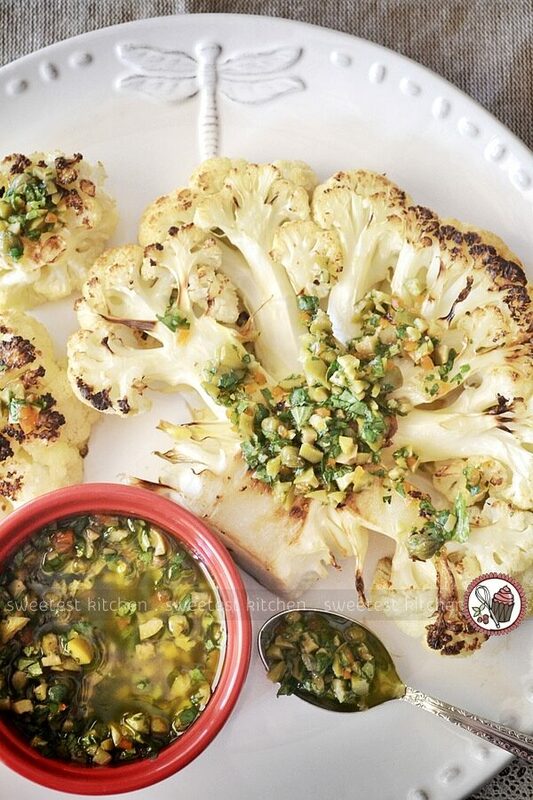 Slices of cauliflower are fried in a teeny bit of oil to give them a golden color, then roasted to soften them up. Served with a bit of olive and herb salsa, this makes for a lively and interesting dish to bring to the dinner table. If you’re thinking about becoming a vegetarian, or are already a vegetarian, or are just simply bored with your usual meals, give this super simple recipe a go. It will blow your mind. 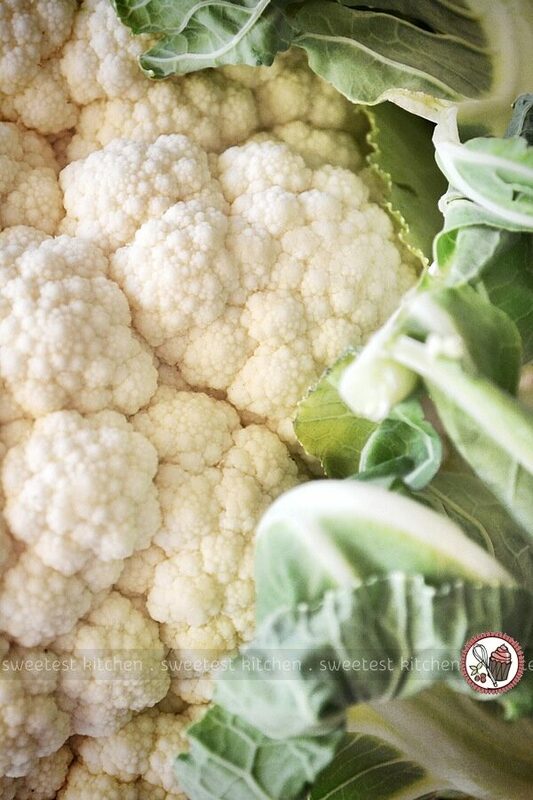 Cauliflower is a very healthy vegetable, containing many nutrients like thiamine, riboflavin and folic acid, as well as omega-3 fatty acids, vitamin K and vitamin C. It’s a good source of protein, fiber, potassium and manganese. It’s also great for cancer prevention, acts as an anti-inflammatory and provides protection from cardiovascular and cerebrovascular diseases. 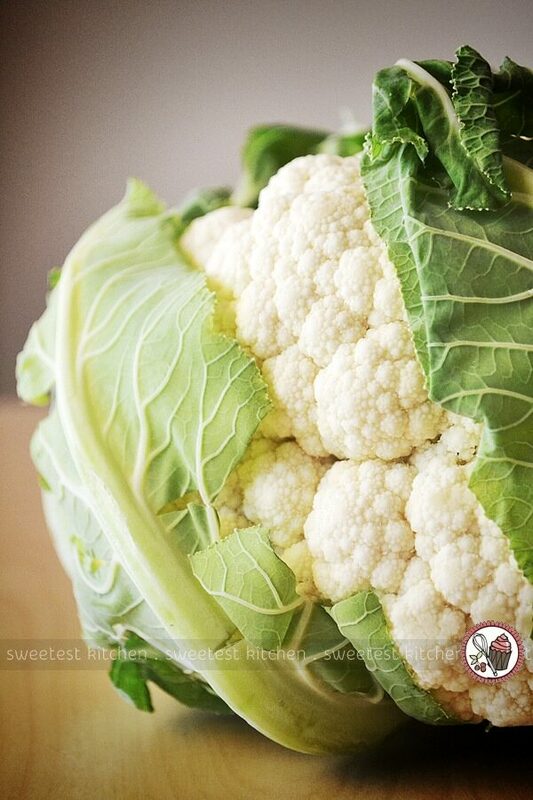 The list of cauliflower’s benefits doesn’t even stop there. 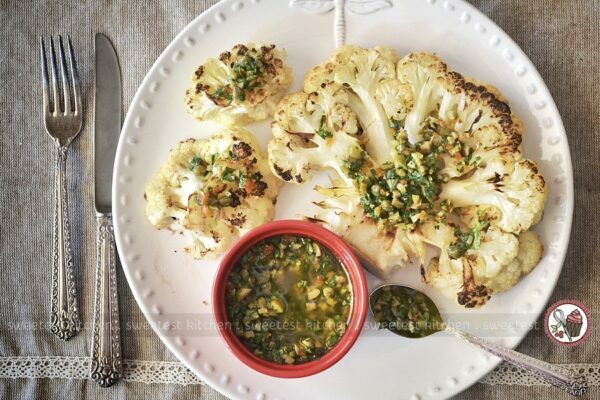 We’re looking at a 1 1/2-inch slice of nutrition-packed cauliflower our our dinner plate, with a delicious salty and herby salsa. You just couldn’t say “no” to this, could you? This is such an easy dinner (or lunch) and includes just a little bit of frying time, and a little bit of roasting time. The salsa can be made in a matter of minutes while the “steaks” are roasting. The trickiest part? Slicing the cauliflower so it stays in one big piece! It’s easier once you get to the middle of the head of the cauliflower, where the stalk is. Make sure you use a sharp knife and handle the slices carefully so they don’t break apart. Admittedly, my daughter, who tries a bit of everything and likes a lot of unusual foods, did not like these cauliflower steaks (but she does like plain, boring cauliflower). My husband, who is not a vegetable-eater by any stretch, did not like these either. But I loved them! And I think you would too. Bring some healthiness to your dinner table with these nutrition-packed cauliflower steaks.